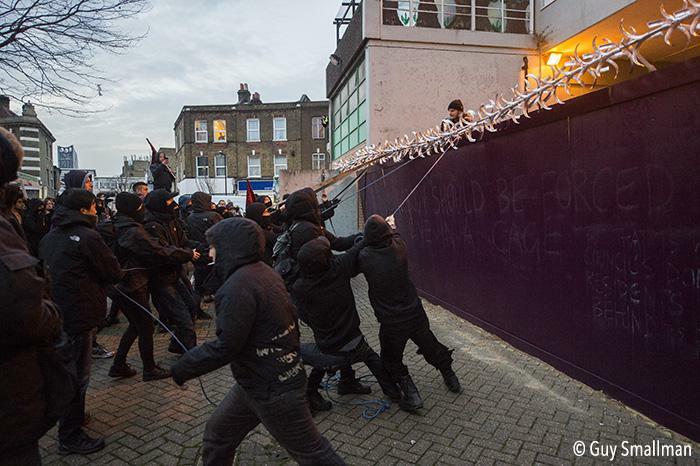 Several hundred people responded to our call-out for an “Eviction Eve solidarity demo”. Solidarity with the remaining residents, who are still living in the enclosure (aka “First Development Site”), and will be for months to come. For the past few weeks, the presence of the fences and security guards has made life intolerable for these people. They have been asking why they’re no longer able to get in and out of their homes using the most convenient routes, and the nearest gates. Despite having guards stationed at each gate 24 hours/day, legitimate residents have been forced to make an arduous detour – of up to half a mile – each time they enter or leave (!) the area, leaving some house-bound. They complain that they weren’t consulted about this arrangement, and that it’s not what they envisioned when they lobbied the council last year to install door-entry systems on the blocks themselves. Whenever their friends or family come to visit, the security guards make them come all the way to the main gate to authorise their guests’ entry. Anyone not capable of walking the extra distance has been unable to visit. Despite having every right to be there, guests of tenants and leaseholders have reported being intimidated and sometimes chased through the estate by security guards. Some of them have even been assaulted and ejected from the area. The security guards have acted unlawfully and with impunity. The police have still not taken any action about these assaults. When the fences went up, and the locks were fitted on the gates, some of the residents were assured that they would be given keys for these locks. Two weeks later, no keys. And no response from the council about any of these complaints. Even when the story made it into the newspapers, all the council spokesperson could say was that they would “review the situation”. Still no word on that review. We’ve been forced to leave Chiltern House, due to the Interim Possession Order granted to the council in court on Thursday. We’ve left the enclosure. With us gone, there is absolutely no excuse for the council to keep treating the residents “like animals” (their own words), trapped in what has now been dubbed “Alcatraz”. Obviously the residents have not been the only people affected by the fences. It’s clear to us that their construction was “expedited” (speeded up) because of our occupations. The council hoped to stop us from protesting, and stop people from the rest of the estate/ world from coming to visit us. If leaseholders and their tenants were adversely affected, the council probably just hoped that it would encourage them to move out quicker, and accept whatever incredibly insultingly low figure offered to them for their flats. Just like the elderly folk CPO (Compulsary Purchase Order) -ed out of the Wolverton flats, these people’s lives are just collatoral damage to Southwark. The council didn’t bother with planning permission or stopping up orders, meaning that the fences themselves are illegal. 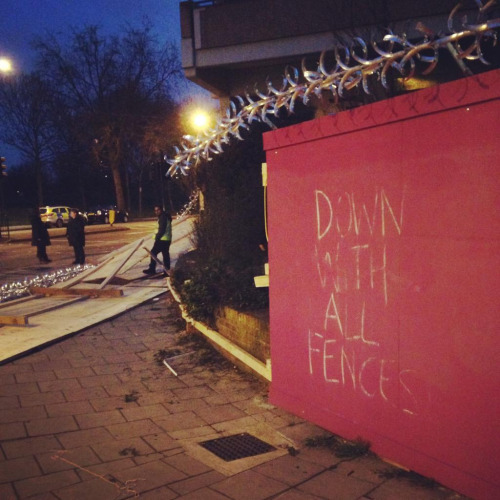 Along with hundreds of others from the neighbourhood, we took direct action against the fences. 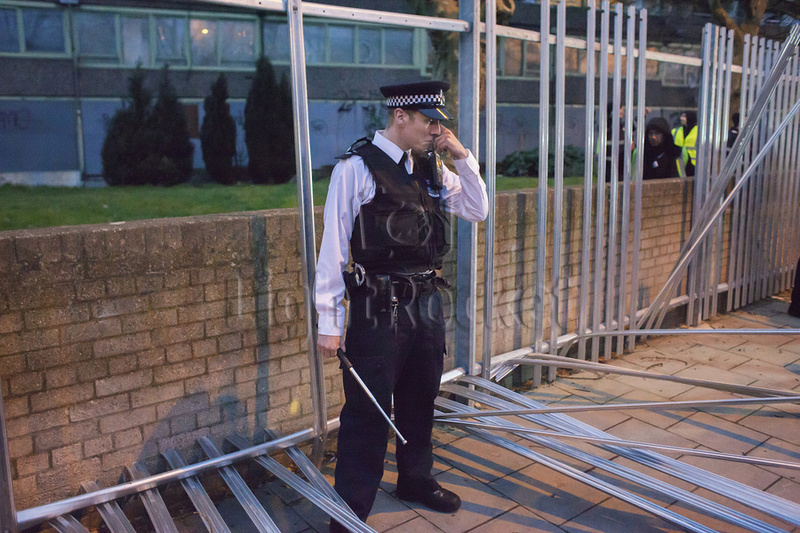 On the evening of 2nd April, we brought down the fences in three places, spread out around the perimeter. No machinery was involved – it was pure people power. The Creation Trust claims to represent those who live on the Aylesbury, and says it cares about their views. It claims to “consult” but isn’t very good at listening. 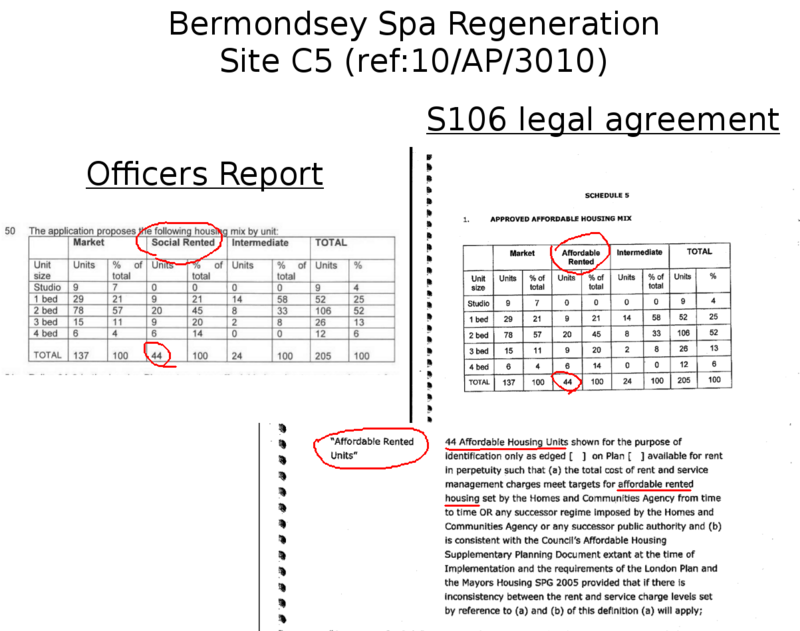 Just like the council itself, it has ignored the complaints of both leaseholders and tenants. These days, the Creation Trust is almost entirely controlled by the council, in the shape of people like Councillor Mark Williams. He could have done something to help the beleagured residents if he had wanted to. Instead of doing something themselves, they decided to brand our action a “cheap publicity stunt”. Anyone who had actually taken the time to read our media policy would find this laughable. We don’t do things for publicity. We do things because they need done. We do things for ourselves, together, sometimes together with others, and we don’t wait for permission. We’re not going to pander to the politicians, to the media, to those paid to “represent”, “consult” or “revitalise” us. We’re not going to sit back and wait for them to do the right thing. They’re already in the pockets of the developers, the privateers, and the other financial interests at play here. 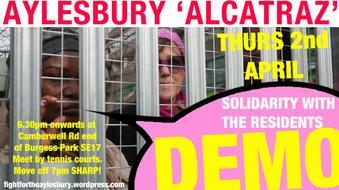 We have not stopped Fighting for the Aylesbury and against its destruction. We continue to stand in solidarity with the leaseholders and tenants who want to stay on the estate. As last night’s demonstration showed, more and more people are willing to take direct action to defend public land and housing. We will continue to take direct action ourselves, and we will continue to occupy space. PS: There was only one arrest on Thursday night. The police have consistently failed to take complaints of security guard violence seriously. However, they did arrest an Aylesbury leaseholder, following an incident with a belligerent guard, well after the fences had fallen, and most of the protestors had left the area. This news prompted a spontaneous, and very lively, solidarity demo at Walworth Road cop shop, which continued long after her release. Despite five hours in custody, she was upbeat about the campaign, and touched by the large number of people waiting for her. We support all arrestees, and will support her through whatever happens next. While we there we met a lot of people, and made some new friends. Including one elderly man who had been called in to collect his daughter at 6pm, and was still waiting for her nine hours later. The custody suite repeatedly told him that she would be released “soon” but refused to give him any other explanation for the long wait in the cold. As he said himself “It’s no wonder that people don’t like the police”. Anyway with our presence and music we made the police station reception a less intimidating and unfriendly place than it usually is. 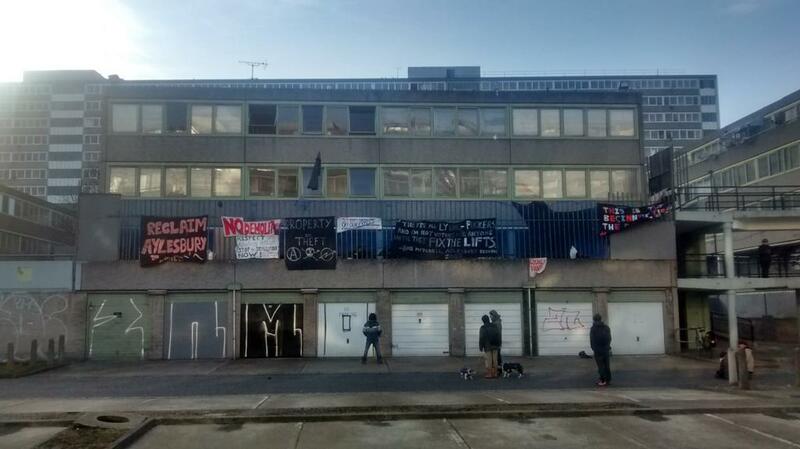 Today, after tearing down the fences built by Southwark council to isolate us, we left our occupation of the Aylesbury Estate. Several hundred people came to destroy the cages. No fence can contain us. No fence can keep us out. 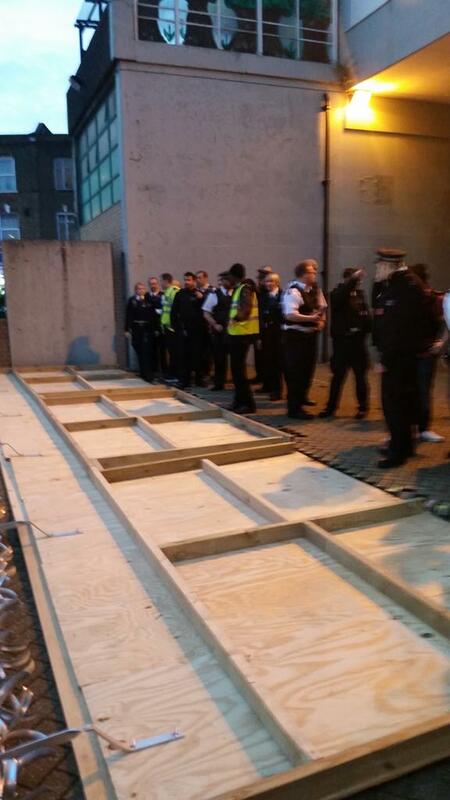 We are squatters who are not bound by the borders of the Aylesbury estate. 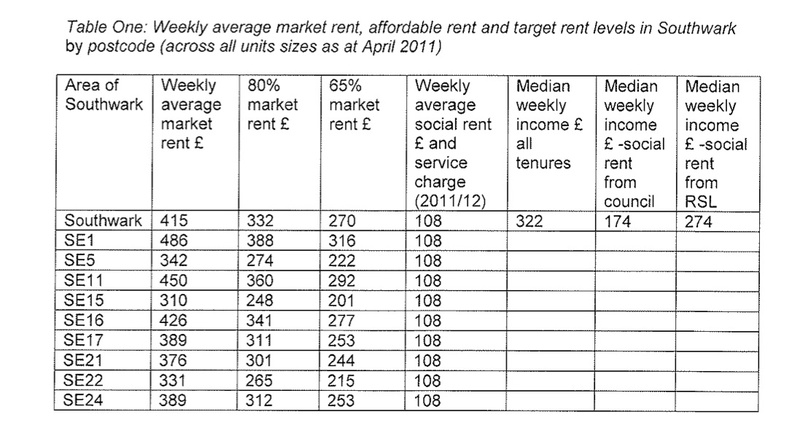 We are residents who still have leases and tenancies. We are everyone who needs a place to stay. We are bound by nothing but this need. See you soon at Aylesbury. See you soon at Sweets Way. See you at the Guinness Trust. See you at UAL, LSE, Kings and Goldsmiths. 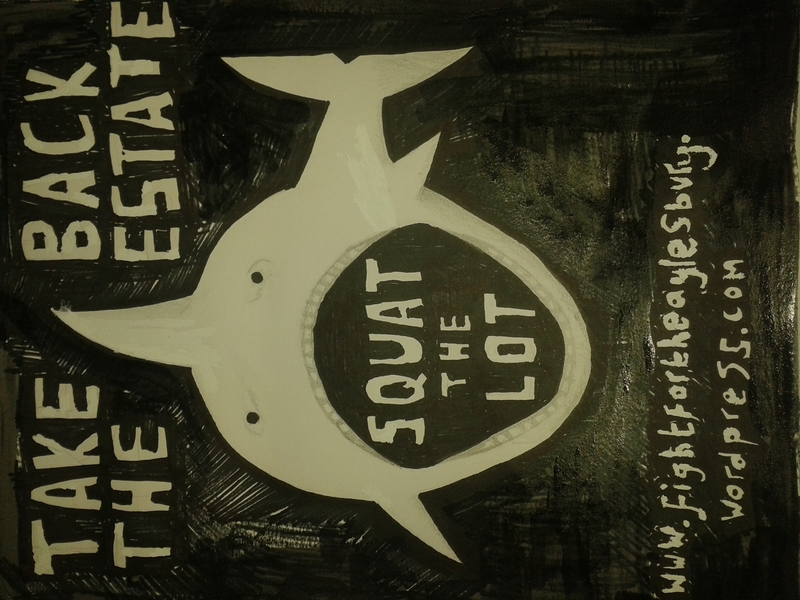 See you soon in all the squats. See you at every protest and minor act of resistance. See you soon everywhere. 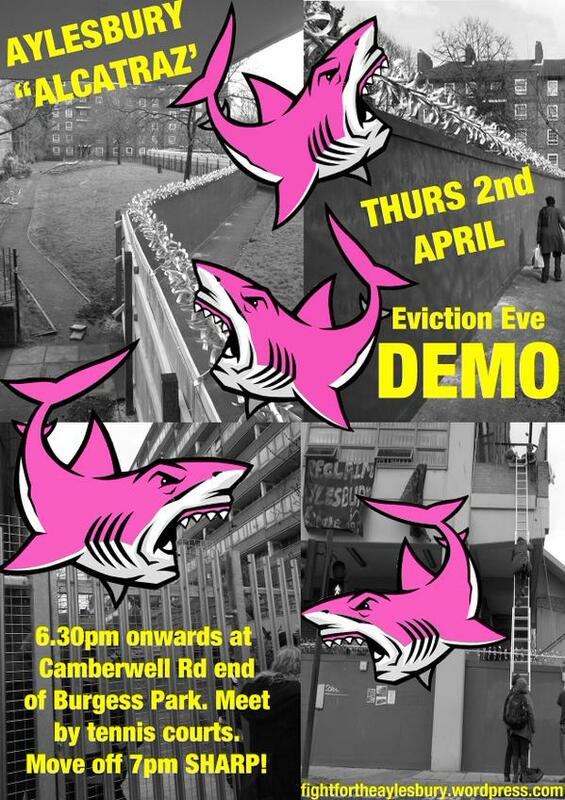 Eviction Eve Demo this Thursday! Over the past few days and nights, we have seen an escalation in intimidating behaviour and actual violence from the security guards. 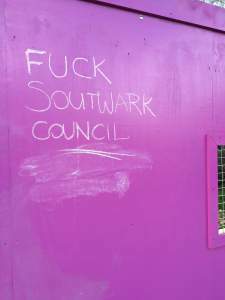 They claim to be following orders from Southwark Council, to deny access to the ‘First Development Site ‘ (FDS) area, which is now entirely sealed off with a large fence. Not just deny access to us (we who continue to occupy in Chiltern) but also anyone else trying to visit the area. 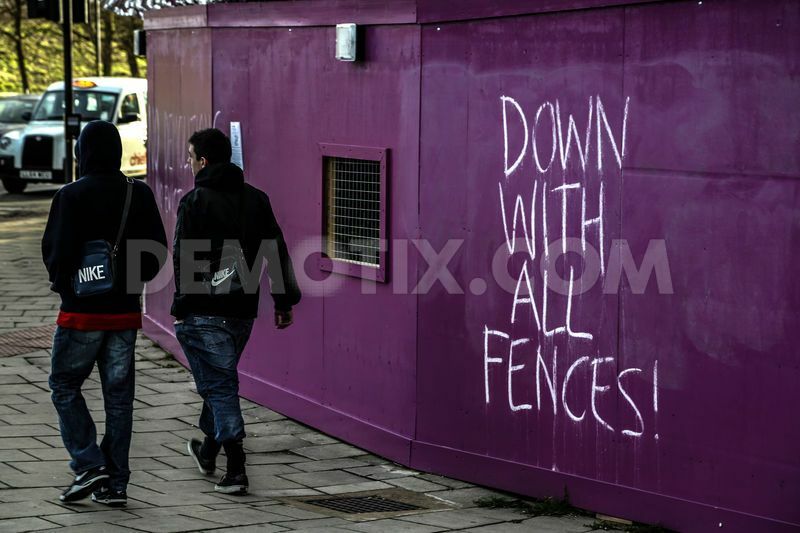 There are still around twenty households (both leaseholders and tenants) who haven’t been ‘decanted’ yet, and they are also suffering from the fencing. Despite the presence of security guards at each of the seven gates around its perimeter, they are not allowed to enter or leave through six of those gates. Instead they are forced to make a lengthy detour, all the way over to the gate on Westmoreland Road, every time they leave their homes or come back in. If guests want to visit them, the security guards insist that the residents must come all the way to that one gate to fetch them. This had made it impossible for many elderly friends and relatives to visit at all, and has left at least one woman housebound. Whenever asked about the fencing/ security arrangements, the council trot out a line about how they did this because those residents asked them to. From our conversations with the residents, it’s clear that this is a lie. Some of them asked for doors to be fitted to the actual blocks they live in, with an entry-phone system to let their guests in, but they didn’t ask for this. They had no wish to deprive people from walking their dogs, or travelling across this corner of the estate, and hate the fact that they now live in what is effectively a big cage. The council ignored their requests, and built the fence without any consultation, without any planning permission (neither for the fence nor for the proposed development) and without obtaining ‘stopping up orders’, even though its construction has prevented members of the public from using rights of way across the estate. When they first fitted the gates, the residents were told they’d be given keys, so they could continue using the gate nearest to their flats/ most convenient for them. However this hasn’t happened. Not content with abusing their power at the gates, the security are also now prowling the enclosure, chasing anyone they see and challenging them in an intimidating manner. They are telling people that this is now a “dead zone” and that nobody may walk through it. They have physically attacked anyone they suspect of supporting the protest, including some people who were making legitimate visits to lawfully occupied flats, and were therefore not trespassing in any way. There have been a number of unprovoked attacks on people within the enclosure, with security guards going well beyond any notion of “reasonable force” when restraining/ frogmarching/ dragging them out of the enclosure/ down stairwells/ down from trees and ladders and buildings. They have kicked, punched and attempted to strangle people. 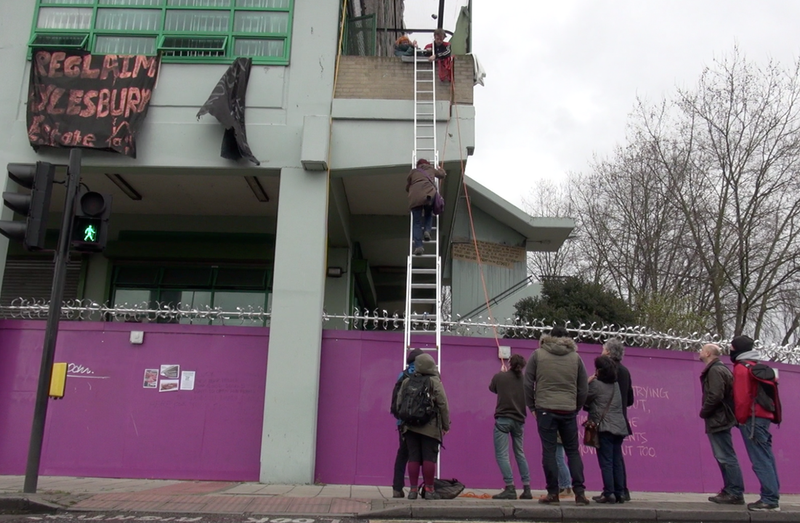 They have stolen items – including a laptop belonging to a supporter of the campaign – and on Friday night criminally damaged a rope ladder belonging to us (after grabbing it while one of our friends was standing on it, with absolutely no regard for his health and safety). Although we have filmed some of these incidents, we haven’t captured them all on camera because in some cases we were caught unaware, or because these things took place in dark corners to isolated people, or because we only have a limited number of cameras at the occupation. Call-out for cameras! And for solidarity action! 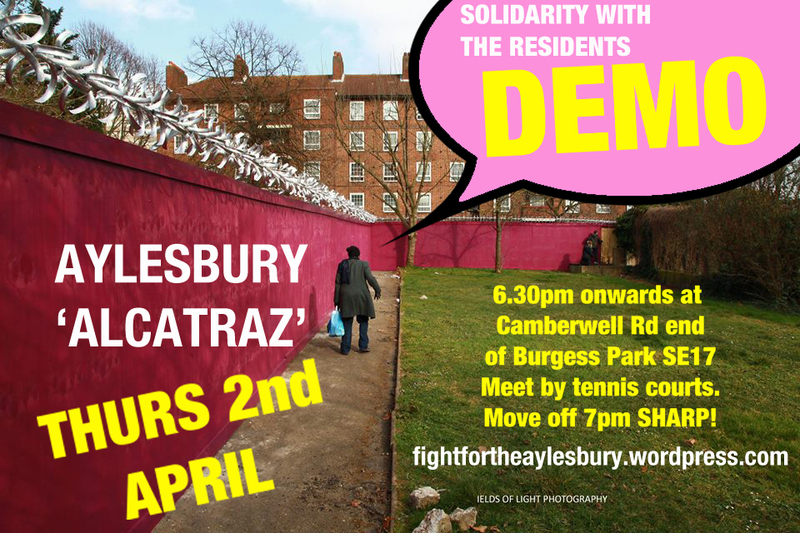 Rather than asking supporters to come along to Lambeth County Court on Thursday morning, we are instead calling out for a demo around the estate itself on Thursday evening. In solidarity with the remaining residents trapped behind the fence. (the main gate onto Camberwell Road, near the tennis courts). We will move off at 7pm sharp! Thank you G.I.G for this response yesterday to our blog post. It points out what the previous article forgot to mention: there are material reasons women and mothers are leading the housing struggle. Women take responsibility for the home and for children and so are the antagonists of public service cuts. Workers struggle, defeated, is giving way to a new class struggle in the sphere of reproduction. Women are the new central subjects of these movements all over the place. If also points out that it forgot to mention that communities (if we must use that word) are not just representations: they are made through struggle. Actions like squatting are everyday resistances which involve our whole life and every dimension of who we are. They can make communities of nasty subtle exclusions and power dynamics. But they are also an opportunity to transform identities like those of gender. Acknowledging these things does not mean embracing the category mother or even the category woman. Why couldn’t this upturning of class struggle be an opportunity to leave these figures, with those of the working unionised male, way behind? Why couldn’t our methods be those which allow us to transform who we are? There is no lack of generosity among activists. And the question “what about those of us who are not mothers?” was not intended to discourage it. The question was a reference to the already existing diversity of those of us already involved in housing struggle. It is by recognising our diversity and looking at how we came to be involved in struggle that we can understand how to keep expanding. Expanding generosity. We now know it is possible to build struggles around public housing where people live close together and all face a threat at once. These situations are like layoffs at the mass factories of the workers movement. They kick off nicely. But how do we initiate struggles beyond these cases? How do we support struggles in areas where there is no need for mass estates to lie visibly empty and be spectacularly levelled? 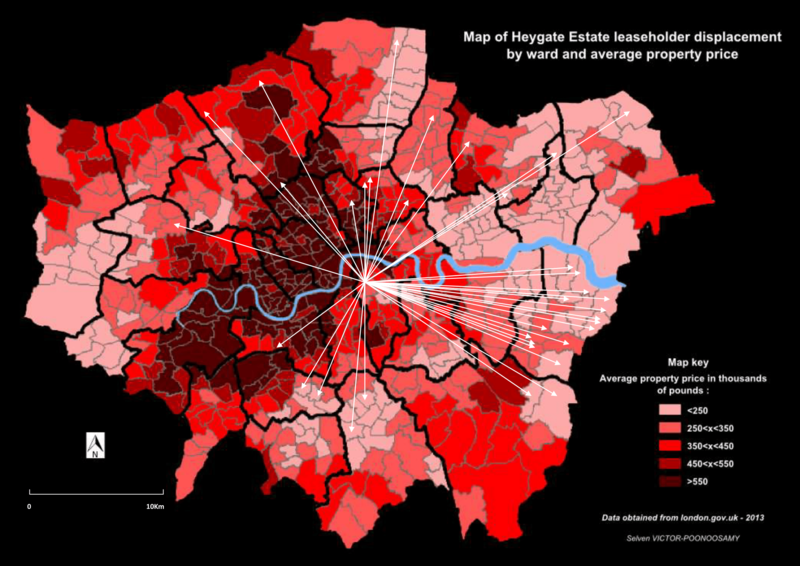 How do we escalate struggles where people live in a mix of private, public and owned housing and where social cleansing relentlessly picks-off individuals over time? So to question the use of mother-family-community as symbolic weapons is not “moralising about right and wrong” against some radical left communist standard. It is elaborating the very practical imperative of how resistance grows amidst people of disparate and racialised gendered identities, different political and religious affiliations and divided material circumstances. Some people may have come to Aylesbury “to ‘better’ themselves, to reproduce themselves through family, work and property” as you say. But we have met others who have come fleeing political repression and who want to continue to fight. Perhaps it was not quite right to say in the previous article that we need to forge a “different” representation of who we are. Perhaps it would be better to say that we need to go beyond struggles in the symbolic domain completely. Perhaps what we really need is to leave behind mediated representations and experiment with the ways different people can talk to each other directly and cooperate together. As you say, “the more corporations and money markets seem indifferent to identity and togetherness, the more the appeal to a lost identity or community is available for mobilisation or exploitation in some form”. But the solution is not to add fuel to the fire. Our strength in London – where so many different people continually pass each other by – lies in our continued indifference to nationalism. And it can be fought by continuing to ignore it and, rather than starting to appeal to anything, fighting together around our immediate needs and experimenting with the different kinds of selves and togethernesses these fights allow. If there has been no let-up in the pace of social cleansing, at least opposition to it is now represented by figures that are warmly received in the media. Motherhood has played a central role in this. Focus E15 Mothers chose to intervene in portrayals of single mothers as incapable, irresponsible scroungers. They created a more empowering image of mothers as serious and capable, even heroes – not only in relation to everyday life but also in relation to the political sphere. As The Guardian put it: “They were once treated as a problem, to be shuttled between temporary accommodation; now they’re pushing solutions to the real issues – preventing London from becoming a city in which the rich live while the rest of us are bussed in to serve them”. They also mobilised tropes of vulnerability and innocence: “Don’t make our babies homeless!” they chanted. 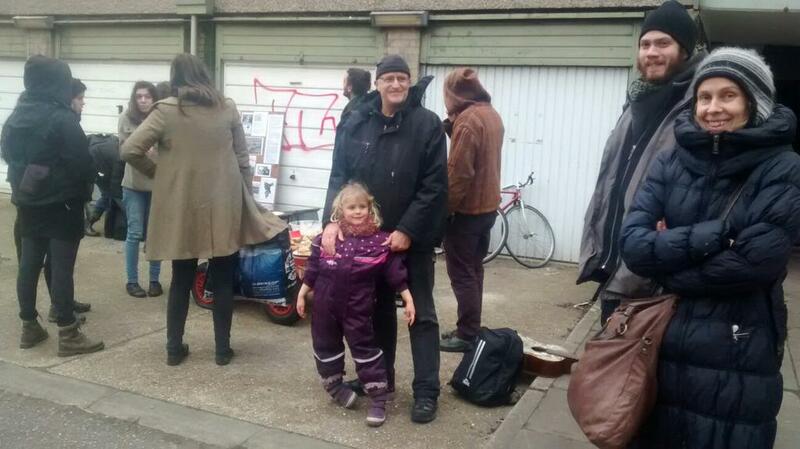 When Russell Brand visited the Sweets Way occupation recently, the resulting videos show him discussing with young boys rather than with their parents. Don’t make out babies homeless! But is not only the struggle itself which created these figures. As a member of Focus E15 pointed out, Jasmin Stone of Focus E15 is a Marxist but this never gets mentioned in the media. The media like to privilege certain groups and divide people into the deserving and undeserving poor. Normally it excludes, for example, black people or recent immigrants from the deserving. We should ask why the figure of the working class mother has been able to symbolise the deserving poor in this moment. Mothers, perhaps, are reassuring figures of reproduction in a time of fear about capitalism’s ability to sustain the state and its population. They conform to the nurturing ideal of womanhood and the link between woman and the home supported by the right. Perhaps they are also safe figures to represent resistance, because older stereotypes are available be resurrected if needed. The category of the single mum will never completely escape its connotations of feckless promiscuity. And it is not just a matter of representation but one of demands. Privileging the struggle for council housing sidelines the needs of others – all those, for example who have no chance of ever getting it. What about childless women? Are we less important? Men? What about less obviously working class people, people with University educations for example, who still live with extreme precarity. Are we less important? This privileging of the needs of a particular group leads to another problem: it puts everyone else in the position of supporting them. It puts them in the position of activists, engage in struggles not orientated to solving their own needs. People advise housing activists not to “go in with their own pre-agenda”. It is important, they say, that “residents” lead campaigns, with activists backing them up… helping them with the media maybe. The problem with this approach is that activists then act like other professionals who craft media representations or perform in the political sphere. No challenge is made to the division of politics from life in general or to the way out interests are perceived as hierarchically divided. 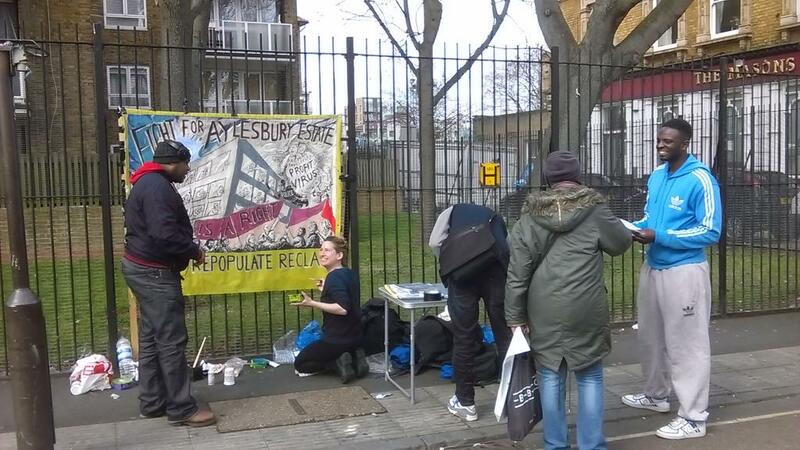 Us in the Aylesbury occupation followed Focus E15 in drawing strength from acting to defend our own immediate practical needs. We described ourselves as squatters rather than activists. We are mainly childless and are from range of class backgrounds. 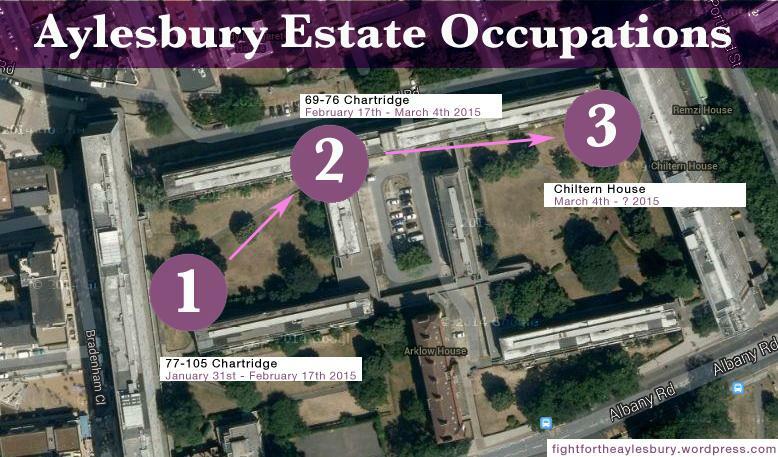 We aim to make Aylesbury our home and to show how empty estates can be directly taken by all those who need them. 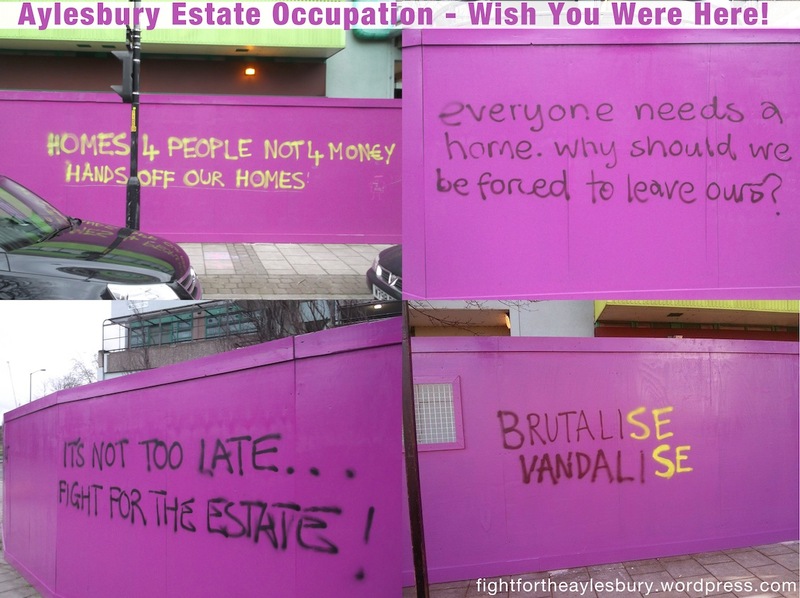 In our work with tenants and leaseholders in the estate, we are trying to build a movement through which we can gain the solidarity to allow us to defend our occupied flats. But in campaigning to “repopulate” Aylesbury and to defend council housing, our stalls and events also involve us making demands contrary to our own interests. The repopulation of the estate by the council would not solve our housing crisis. Unity brings us to the problem of community, another concept mobilised with regularity when we speak about the housing struggle. Again, this term is loved by the right as much as the left. But what does it really mean and who does it include and exclude? Many people are forced move around within London a lot, are migrants who have only lived here a short time, or live their whole lives totally cut off from their neighbours. Talking about community is at best a lazy, media-friendly way to talk about class struggle. When we say community, we should mean choice in where we live and who live with and security and power in the place we live.